This presentation does not try and predict the future, but it does provide a framework to understand trends that relate to digital media. The “cloud” has come to mean a shared hardware environment with an optional software component. In libraries, cloud computing technology can reduce the costs and human capital associated with maintaining a 24/7 Integrated Library System while facilitating an up­time that is costly to attain in­ house. Libraries, and libraries’ perceptions of the patrons’ needs, have led to the creation and acquisition of “web­scale” discovery services. These new services seek to amalgamate all the online content a library might provide into one bucket. Steven Bowers is the director of the Detroit Area Library Network (DALNET), at Wayne State University. He also co-teaches a course on Integrated Library Systems for the Wayne State University School of Library and Information Science, with his colleague Elliot Polak. Bowers was featured in the 2008 edition of the Library Journal’s Movers & Shakers. A.J. Million is a Ph.D. candidate in the School of Information Science & Learning Technologies (SISLT) at the University of Missouri, where he teaches digital media and Web development to librarians and educators. He has written journal articles that appeared in Cataloging and Classification Quarterly, the Journal of Library Administration, and OCLC Systems and Services. His dissertation examines website infrastructure in state government agencies. Elliot Polak is the Assistant Library Director for Discovery and Innovation at Wayne State University. Prior to joining Wayne State Elliot spent three years at Norwich University serving as the Head of Library Technology responsible for evaluating, maintaining, and implementing systems at Kreitzberg Library. Ken Varnum is the Web Systems Manager at the University of Michigan Library. Ken’s research and professional interests include discovery systems, content management, and user-generated content. He wrote “Drupal in Libraries” (2012) and edited “The Top Technologies Every Librarian Needs to Know” (2014). Can’t make the date but still want to join in? Registered participants will have access to the recorded webinar. Education, General information, News & Noteworthy. permalink. 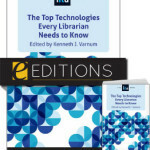 Is Technology Bringing in More Skillful Male Librarians?